Preheat oven to 400°F. 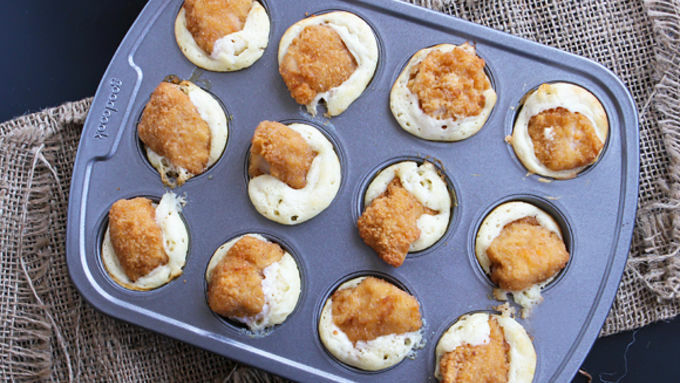 Spray the inside of mini muffin tins with non-stick baking spray. Slice butter into six 1-tablespoon slices, then cut each slice into four small cubes. Place one cube in the bottom of each mini muffin cup. Drizzle 1/2 teaspoon of honey over the butter in each cup. Stir the pancake mix, milk and egg together until blended. Pour just enough batter in each muffin cup to fill the muffin cup 3/4 of the way with batter. 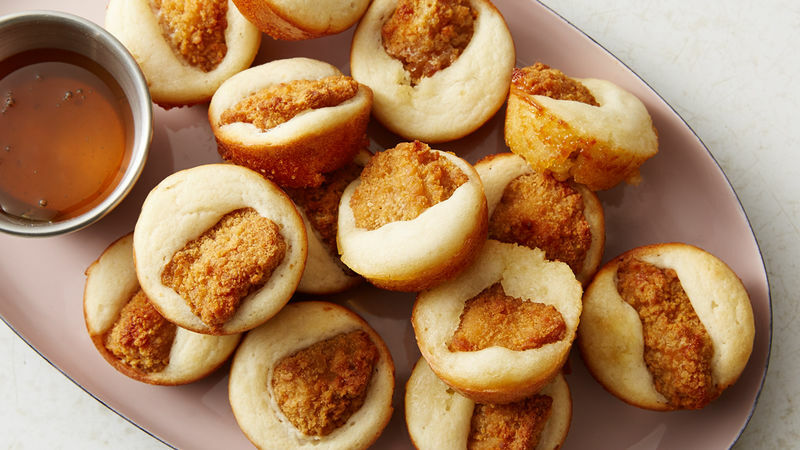 Press a breaded chicken chunk into the center of the batter in each muffin cup. Serve with remaining honey for dipping. Enjoy! OOO-wee, honey! Chicken and waffles never tasted so good — together! Dripping with honey and love, you gotta give 'em a try. So, here's the thing. Are you ready for the behind-the-scenes dirt from the Tablespoon table? Here goes…when the editors suggested this recipe for May's lineup, I cringed my nose. I was, like, all you want me to bake a chicken nugget in waffle batter? Like, whaat? They, being the gentle and eternally fierce foodies they are, insisted it could be a thing. So, I resigned myself to their whims, and figured I'd try it. At least I could tell them I tried when I returned later to admit defeat. I gathered the ingredients and got all ready-like in the kitchen. 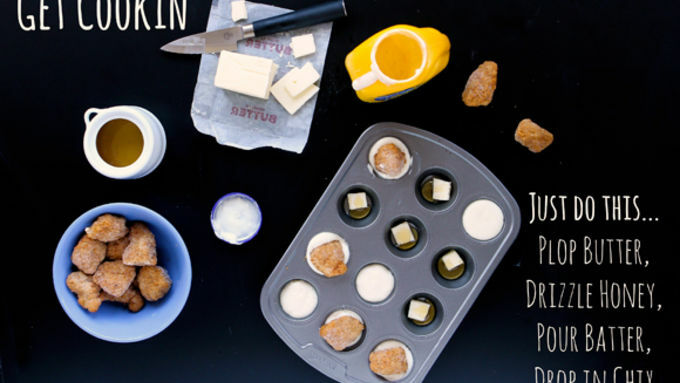 A plop of butter and honey seemed just about right, so plop-plop…into the mini muffin tins they went. A little batter. A chicken nugget. And eight minutes later, out they came. And…oh. My. Gracious. They were perfect. A hint of honey buttery gooeyness at the bottom. Just enough barely-sweet waffle batter around the chicken nugget. I slathered the lot with honey and devoured theentirebatch. You have to try these. I am not kidding. They taste like those little morning chicken-and-honey rolls you pay five bucks for at that fast food chicken joint down the road. They taste like grandma's kitchen. They taste like a southern kiss. And they're so easy to make! 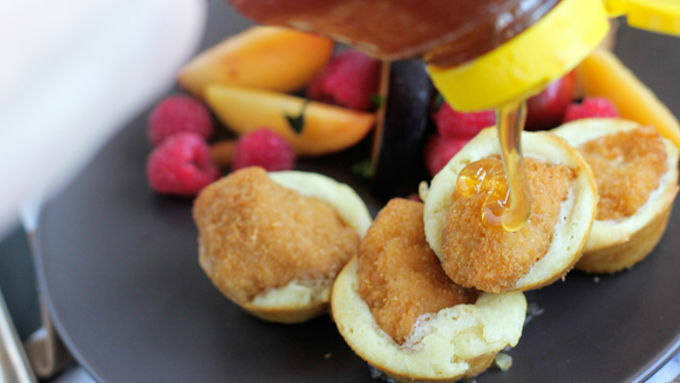 Fingers in, mouths open, it's time to indulge yourself, chicken nugget ‘n waffle style!